Movie-based games for the NES were very common, and it’s safe to say that most of them aren’t the best games you’ll ever play. The same can also be said for games based on comic book games. Combining the two genres usually spells an instant recipe for disaster. However, unlike most games, the 1989 release Batman game, based on the film of the same year, is an exception to this formula. 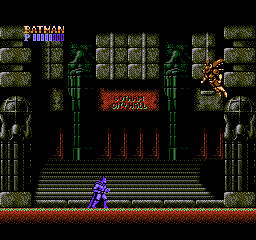 Developed by Sunsoft, Batman is far from a trend-setter; it is similar in style to games such as Shatterhand and Castlevania. However, Batman takes the formula established by other games and makes it its own. Batman features one primary weapon and three sub-weapons, again similar to Castlevania. However, unlike that game, Batman has access to all three sub-weapons at any time and can rotate them by pressing Start. In addition to his primary punch attack, Batman features his standard batarang, a batarang that explodes into three rockets and, in an odd choice for Batman, a gun that shoots rockets. Each weapon can be refilled by obtaining power-ups from defeated enemies. The remainder of the controls are decent: A jumps while B attacks. Batman was one of the first games to include a wall jump, allowing him to climb two walls that are in close proximity to each other. One slight annoyance is the delay in jumping. Before every jump, Batman crouches on the ground for half a second before jumping, which can sometimes lead to timing problems. 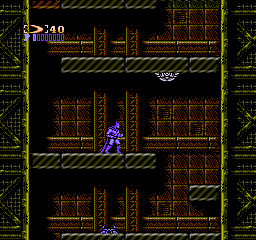 Like most NES games, Batman is a challenging game, often in the platforming that is required to traverse a level. Levels often scale vertically and your greatest enemy is not the enemies themselves but the placement of them; it’s not uncommon for any enemy to be placed next to a jump. While Batman does have a life bar and can survive more than one hit, you will frequently find yourself dying. The graphics in Batman are appropriate for the subject matter. The color palette features dark colors and the characters, while presented realistically, work well. Batman himself is presented in a dark purple which allows him to stand out amongst the dark background. Characters are animated well, especially Batman. After each set of levels, you are treated to a cut scene that, while not the greatest showcase of what the NES can do, is still impressive as cut scenes were not found in most NES games. One interesting note is that when Batman is defeated, he disintegrates as flames consume him, rather than just fall over and perish; it’s always fun to watch, which is good, because you’ll be seeing it often. The sound effects are average, but where Batman really stands out is its soundtrack. Arguably one of the best soundtracks of any NES game, every track in this game features impressive beats that you will remember long after the game is turned off. The only difference between the NES release and the Famicom released is in the aforementioned soundtrack. The Famicom version features the same songs as the NES game, just in a different stage order. Overall, Sunsoft did very well to bring Batman to the top of its genre using its unique graphics, great soundtrack and impressive gameplay. If you enjoy platforming games of the Castlevania variety, and are up for a good challenge, you will have no problems getting into this game. If you like Japanese video games, check out Dave’s site: retrogamerjapan.com. He’s got a nice collection of Famicom and Super Famicom consoles and games. I remember how frustrating this game was for me back in the day. The platforming was very rigid and frustrated me to no end, so I don’t think I ever did beat it. Might have to change that. It really does seem like a great game, once one gets a feel for it.